Today was a day to put down in the books for sure! 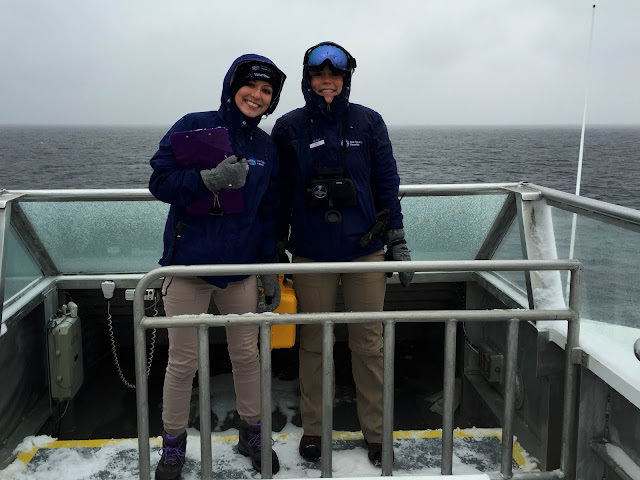 We had a snowy adventure aboard the sanctuary with surprisingly calm seas. Captain Adam and I were excited to experience our first whale watches in the snow together and were determined to find whales! Captain Adam zigzagged back and forth across the bank while Kelsey and I, out in the elements, squinted through ski goggles in search of snow blows! Our efforts proved fruitful as we came across two humpback whales (my first humpbacks of the season!) and a nearby solo. We were pleased to identify the duo as Egret and a familiar unknown regular from last year. 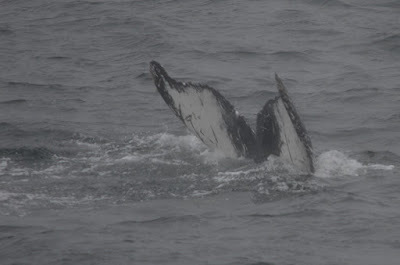 These humps appeared to be logging but soon started moving slowly south. We got to spend a lot of time with these whales as they traveled, giving eager guests beautiful views of their uniquely marked flukes! As we made our way for Boston, passengers and crew alike warmed themselves with hot chocolate in the shelter of the cabins, watching the snow fly by the windows and into the ocean. 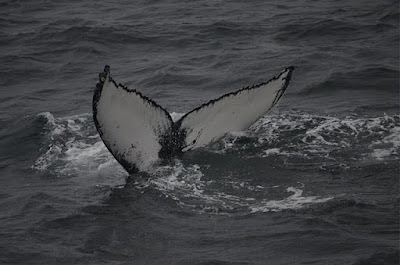 We certainly had a whale watch to remember!